We are relatively short in beekeeping experience and wisdom at Many Hands Organic Farm. Way back in about 1981 or so we got a beehive under the auspices of the Dorchester Gardenlands Preserve in Boston and put it in our tiny side yard. The bees died. But I must say that I had no training from an-yone on how to manage them, and as I was managing 4 children under 4 at the time, I perhaps didn’t have the energy or time to educate myself. We brought that hive out here to Barre in 1982 and perhaps put in another batch of bees that died. After a hiatus of 34 years, Jason, one of our most enthusi-astic employees, got us started with bees last year, under the guiding hands of Roland Sevigny and Charlotte Trim. They did fantastically, but alas, we missed the window for adding more frames and the queen took off with half the hive. There was no viable queen left in the hive and the colony died. They did produce a wonderful supply of scrumptious honey, however. With more help from Roland and also Dan Conlon, Clare has taken over the bee yard, and we have added another hive to our holdings. The bees have been here two weeks. Although we have a bunch of beautiful fruit trees in bloom and a plethora of dandelions to feast on, the bees have barely come out due to the constant cold, rain, cloudiness and drizzle. Hopefully with next week’s forecasted warm and sunnier weather the girls will take flight and start working full-time. Although Roland has been nagging me for years to learn about bees, I have been very reticent because of my limited eyesight. I don’t think I can discern the difference between a queen or a worker bee, nor a drone, for starters. But when this book showed up to be reviewed, I decided I should at least get on board intellectually with the beekeeping that we hope to make a more prominent part of our farm practice. Jason will ever be our guide on this project, and we all owe it to him to take on this work. 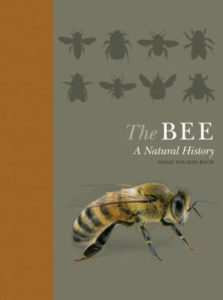 So I review “The Bee: A Natural History” as a rank amateur. Keep that in mind as you read this. It is a very beautiful book – the kind of book you would want to share with your kids or grandkids because of the beautiful pictures throughout. It is also nice for the coffee table because each section is exactly 2 pages long, so it could be used for bedtime stories, or could be a quick reference tool for the new beekeeper, or the person who likes to collect cool facts like the one that I learned about worker bees maxing out as foragers – the top of the line job – at age 25 days. Or that worker bees don’t have children because of a pheromone that the queen spreads throughout the hive to repress their reproductive capacity. If her scent weakens or she dies, the workers will lay drone eggs, but won’t be able to produce worker bees, with the demise of the hive only a matter of time. Or the seemingly gruesome fact that when a drone breeds a queen, his phallus stays inside her and rips off from his body so that he dies after he has mated. This book is broken into the following chapters: Evolution and Development, Anatomy and Biology, Society and Behavior, Bees and Humans, Beekeeping, A Directory of Bees, and the Challenges Faced by Bees. In the end of the book are Useful Resources. Strengths that I would enumerate include that there is a wide and thorough variety of information for anyone who really wants to get a broad under-standing of bees, not only the honey bees that people tend to manage, but the other species like bumble bees, mason bees, stingless bees and others. This book can be picked up and put down, and is great for those who can only read about 2 pages per day before falling sound asleep at night. The headings in each chapter are very explicative, and thus make this book quite accessible as a reference tool. For example, the Anatomy and Biology Chapter is broken down thus: it includes What Makes Bees Different, Anatomy of a Honey Bee, Flight and Internal Anatomy, Bee Senses, Genetics, Genomics and Infor-matics, Hormones – the Endocrine System, Immunology, Pests and Diseases, Reproduction, The Bee’s Life Cycle, and Pollination. I was fascinated by the Society and Behavior Chapter with its sections on, among other things, swarming, dance, communication and navigation. That people have been able to understand the dance of the bees is stupefying to me and that, for example, we understand that bees use a variety of senses and a variety of environmental cues to navigate – including sun, smell, landmarks and electromagnetic waves. I mentioned before that the pictures in this book are astounding. They are worth a thousand words, especially for someone like me who has such a hard time seeing what is going on in a real live hive. At the end of the book, in the Directory of Bees, there is a page for each of 40 varieties mentioned, broken out by solitary, bumble, stingless and honey bees. Additionally, the graphics and side bars were also very easy to understand and interesting. Take this little vignette on the male wool carder bee on page 67. He stakes out and patrols a given area and fights off any other male who comes close to his harem. He will dive bomb them, drilling through their wings so that they drop to the ground and eventually die. My biggest challenge with this book was the font size (small) and the variety of background colors for the text (sometimes black and really hard to read). And there wasn’t much on beekeeping per se, but the book didn’t suggest that it was a “how to” book. If I were a beekeeper wanting one book, it wouldn’t therefore, be the only one, but it is a nice addition to a beekeeper’s library, or for those who really enjoy knowledge for the sake of a broader understanding of life around us. However deeply I may or may not get into beekeeping personally, I now feel that I have a baseline of understanding on bees, wild and farmed, and a level of comfort and understanding of their point of view on life that will stand me in good stead as I continue to develop as a farmer and farm ecologist and steward.